I think it's fair to say that there is no other boat quite like a Fireball. As 1960's designs go, the Fireball has stood the test of time rather better than most of its contemporaries. It is firmly stuck in the symmetric kite camp, thereby ruling it out for a lot of trendy people, but nevertheless remains resolutely the most popular 2-person, single-string racing dinghy of the last 30 years or so. It is also (and perhaps crucially for a lot of the owners) not a boat that demands much by way of physical fitness. No review of the Fireball would make sense without an early mention for Winder Boats, who have made the best hulls money can buy for well over 25 years. Whether wood, wooden decked 'composites' or fully foam-sandwich, the Winder hull (with or without the optional kevlar stiffening) simply goes on forever and remains competitive too. Whether you're buying a brand new one, or something 20 years old for £1200, you'll be wanting a Winder then sir. 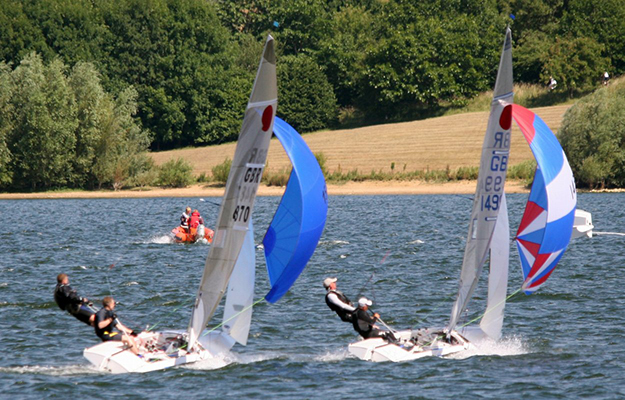 And don't turn your nose up at the 20yr old composite boats either, one of them came 7th at the nationals recently. Sail number 14000ish is entry-level territory for foam-sandwich boats. At the other end of the scale, what you definitely don't want is some wooden fixer-upper item built circa 1970 as seen on eBay, these bear only a passing resemblance to a modern Fireball and most of them are only fit for the bonfire. As a rule of thumb, if offered anything with a sail number less than 13000, run away very quickly and don't look back. So you bought a Winder then, what do you get and how well does it work? Fittings vary depending on the mood of the company that screwed them on. You might get all Harken or you might not, but it doesn't make a lot of difference. There are no sacrificial parts and nothing that's particularly prone to breaking - everything just sits there and does its job with no fuss. Sheets gradually wear out over time, the springs in the jib cleats need replacing every now and then, and the elastic in the take-up systems needs renewing occasionally. At 76Kg (due to class rules), the hull is probably 20Kg heavier than it could be, but it will last for ever. For a high performance boat with a heavily tensioned rig, the Fireball is very gentle on its spars. Carbon fibre is banned, so it's aluminium all round. Booms only ever break if the crew falls on them from a great height, masts likewise although they supposedly become work-hardened with age, which makes the hotshots trade them in early. 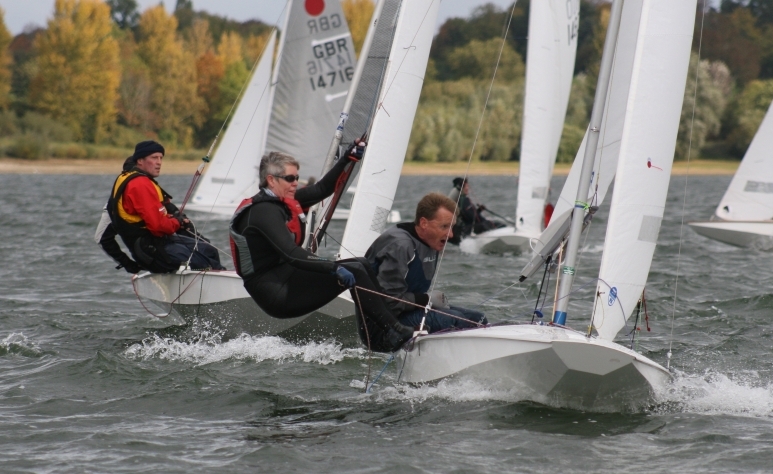 Sails are less praiseworthy, whether you use olde-worlde dacron or the cutting edge mylar/kevlar laminates, the tendency to apply loadsa kicker, coupled with the overly short battens mandated by class rules, gives you an effective lifespan for mainsails of no more than 4 years of solid use. Jibs go on forever, but look totally manky after 12 months. Spinnakers would probably last forever if we didn't keep using them in 25 knots of breeze, or trying to fly them on a reach that is just that little bit too close. They rarely rip, but they do stretch and become somehow indefinably less good than they were. When you do eventually go shopping for new sails, the list price for a complete suit can be anything up to £1800. But we're not in SMOD land, you've got a choice of sailmakers, they all want your business and they will do you a deal. So you can bag a new kevlar main, dacron jib and a kite for around £1200 during the winter months, although you'll probably pay more in the summer. Don't turn your nose up at ex-jockey kit either, just count the creases and knock some more off the price. The boat has an excellent windstrength range, capable of coping with everything from roll-tacking in a drifter right up to 30+knot winds. The rig is sufficiently adjustable that you can flatten the mainsail, get it to twist off at the top, open the jib slot etc, thus making the boat highly adaptable to whatever the wind-gods want to throw at you. And with the trademark scow nose and a decent amount of rocker, it won't nosedive on inland waters, although this does happen occasionally on the sea. Because the class rules are pretty relaxed, you can set your boat up to have extra purchase where you need it, and you can buy a flat cut mainsail or a small kite if you've got a lightweight crew. Automatic pole launchers can be fitted to take the hassle out of that bit, and you can still get boats with spinnaker chutes if your crew can't be bothered to do kite retrieval. But most boats are just plain vanilla flavour, straight out of the box, no frills. When you leap nimbly aboard, the overall impression is one of a well sorted, stable and responsive boat, possibly with a bit more string than you were expecting. The cockpit is open and uncluttered by metalwork – no hoops or racks to smash your face into. The mainsheet block is up on the centreboard case, so there's no scrabbling about on the floor and getting it tangled up with other stuff. All the controls are led back to the helm, including the ones you never use – hence the excess string. The rudder feels light and well balanced, and is big enough to get you out of trouble even when the boat is heeled over on its ear. Both foils are lightweight and beautifully made incidentally, making the average SMOD stuff look agricultural by comparison. The sheet loads are pretty reasonable - the author is an unfit wimp and even he doesn't use the optional granny-loop on the mainsheet or the ratchet. And in deference to 40+ years of refinement, everything just works (assuming you rigged it right), which is handy if you prefer to concentrate on racing the thing. Unlike many other two-person boats, there's plenty for the crew to do, he or she doesn't just hang out like mad and get cold while holding a bit of rope. The trapeze makes the crew the prime-mover for getting the boat flat, and the jib is an important bit of sail if you're going upwind in a blow – fail to ease it in the big gusts and you can practice swimming after your high-dive. Offwind you get to deploy the pole and launch the kite and play it (while trapezing) and then retrieve it. You won't be bored in anything from 10knots of wind upwards, and you won't have to hurt those lovely legs by hiking out either. If (when) you capsize you'll observe that the boat stays on its side for a respectable period of about 10 seconds before the mast begins to dig in. This is due to the narrow beam, which also results in the centerboard being quite accessible from above or below. Climbing in again from the water is no big deal either, due to the low side-decks. The boat doesn't exactly come up dry, especially if you were both on the centreboard, but the bailers and transom flaps empty it pretty rapidly. And assuming your hatch cover seals work, your buoyancy tanks will be empty too, no leaky seams in this boat! Make no mistake then, this is a modern and well sorted boat built to a classic design - if it was a car it would be the Mazda MX5. There are compromises of course, the kite is small enough to work on close reaches, but as a result can leave you feeling a bit under-powered on the run. The chisel nosed bow crashes across the waves rather than biting through them, and much like the classic British sports car, it often feels faster than it actually is. But overall, it works well.